This book was furnished by the publisher in exchange for my review. 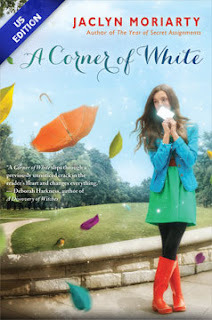 A Corner of White is the newest book by best selling authorJaclyn Moriarty. 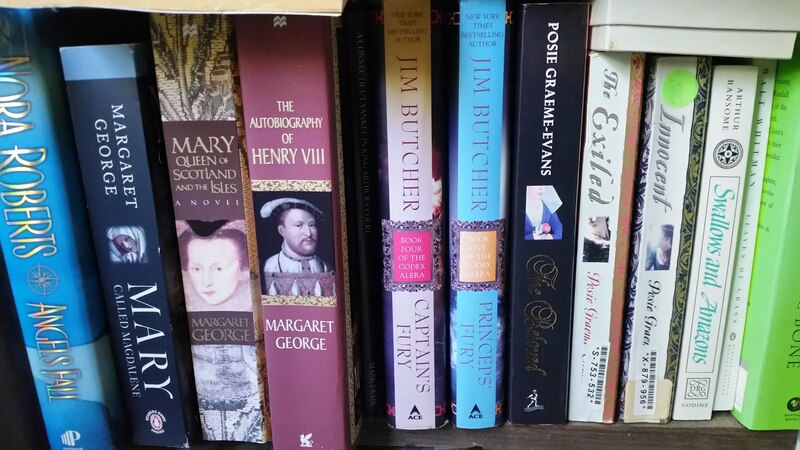 I was drawn in by the publisher's review of the book that I read online. It talked of a book that is "rousing, funny, genre-busting" where the characters exchange messages across worlds -- through an accidental gap" and hinted at "even greater mysteries...unfolding on both sides of the gap". That was enough to entice me into reading the book, and I have to say, I'm glad that I gave it the time. The two main characters in this book, Madeleine and Elliot, live in two separate worlds. Madeleine lives in Cambridge, UK, in our world. Elliot, however, lives in Bonfire, The Farms, in the Kingdom of Cello. Both characters are wrestling with family issues, and issues regarding their place in their worlds when they start communicating through a gap that exists between worlds. Sounds like a typical young adult fantasy book, right? Here is where the genre-busting part comes in, though. This book is as much a coming-of-age book as it is a fantasy book. There was so much about this book that really drew me in as I read it. Not being familiar with Moriarty's work in general, I had no preconceived idea about what a character in her book is typically like. What I found, though, is that her characters were all kinds of things. They were quirky, like Jimmy the deputy who can solve missing person cases with an uncanny success rate, or Holly, Madeleine's mom who is hooked on a quiz show, but cannot answer a single question correctly. Some of the characters made me laugh, like Jack and his fascination with Byron the poet, some tugged at my heart-strings, like Elliot's cousin Corrie-Lynn. In fact, there were a number of top notch characters in this story. Moriarty's choice to include two separate worlds as the backdrop for her story was the stroke of a master. At times things between Cello and Cambridge seemed so similar, and yet they were completely different in most ways. Yes one world, Cambridge, is rooted in reality and the other, Cello, in fantasy, but there is more to it than that. Both worlds contained things that seemed as normal as apple pie, and things that were distinctly different from most people's experience. Both contained things that seemed grounded in reality, but also things that were unexplainable, mystical, or even magical. One thing I really liked was the way that Elliot's friends, although they were living in the "fantasy" world had mostly "real world" characteristics, while Madeleine's friends, living in the "real" world of Cambridge had characteristics that one would normally expect to find in a "fantasy" world. Also included in the book were a number of plot devices that really helped to round out the story. My favorite was Moriarty's use of the correspondence between Elliot and Madeleine to illustrate the differences between worlds and highlight important factors. Another was Madeleine's fascination with Isaac Newton. If there was anything that might be a bit off about the book, it would be the beginning. I know a number of people that found it either slow or confusing. In fact, in most of the reveiws that I read where the reader did not finish the book, their complaints about the story would have been answered if they had kept reading until the end. Although the slow start did not affect me personally, the fact that it kept some readers from finishing a book that, judging from their comments, they would have liked, is a negative. I liked the way that Moriarty developed the story slowly allowing me to get familiar with the characters, the Kingdom of Cello, and Madeleine's world in a way that built a growing appreciation of them all. I also liked the way that she did not reveal everything at once. It was like pulling apart a set of nested boxes, and finally getting to the present in the middle. And what was the present in this case? I would have to say it was the ending which was surprising....both in it's revelation and it's appropriateness. It definitely left me wanting more. All in all this was a deliciously strange book whose best qualities were the voice of the narrative, the complexity of the characters, and the crafting of the end. It is a top notch set up for the trilogy which is certain to get a number of readers on board and highly anticipating the next installment. I give the book 4.5 stars and am definitely putting it on my "Recommend" list.